How to set up a home lab. I’ve long considered this to be a useless post, because there are plenty of tutorials out there on the net with tips on how to set up your own home lab if you’re going for Cisco certifications, but since people keep asking me, and I’ve learned some things now, I’m going to write an article about this anyway. I’m going to start with routers. Good news if you’re short on cash: you can do nearly everything related to routing on GNS3. I’ve already described how to configure it in another blog post. I recommend at least one real router, just to have a better understanding of it. A 2611XM, 2621XM, and 2651XM are great models for CCNA, CCNP, even CCIE level tasks. The ‘XM’ means they have extra flash and RAM, which allows them to run a lot of different IOSes. The non-XMs can’t run any IOS that supports IPv6, for example, unless you manually upgrade them. The last ‘1’ in the name means it comes with an extra ethernet interface: two instead of one. Keep in mind the 2611XM has Ethernet interfaces of 10 Mbps, which is fine in a lab environment but can be limiting at times. I’ve heard positive reviews about the 1700 and 3600 series routers, but they seem to be a bit more expensive. Modules: for extra ethernet ports, you can look out for a NM-1FE-TX, NM-1FE2W (one FastEthernet) or NM-2FE2W (two FastEthernet). A NM-16ESW gives 16 switchports. The NM-4A/S and NM-8A/S provide four and eight serial ports respectively, allowing you to configure a router as a frame-relay switch. WIC-1T and WIC-2T also provide serial ports. Keep in mind that a WIC-2T has ‘smart’ serial ports, which are smaller. Do not confuse them with an expensive NM-16A/S or NM-32A/S. These allow you to configure a router as a console server, giving out-of-band access to the console of all other lab devices (perhaps I’ll make a blog post about this later). WIC-1T on the left, WIC-2T on the right. Don’t go for any 2600 series without ‘XM’. It will run CCNA topics perfectly, but anything beyond that usually requires a larger IOS for which it has not enough RAM. Same for the 2500 series, these are even older, with one Ethernet interface (10 Mbps), leaving you with some basic configurations only. Modules: consider any specific module like ATM, BRI/ISDN, Coax… a useless add-on. Voice ports have no real use either. For decent practice, you will need switches, as there are is no software that can completely replace them at this time. You will need one at the very minimum for CCNA, but two are better. CCNP needs two, best three, CCIE at least three. If you intend to go for just CCNA, maybe CCNP, you’ll need layer 2 switches. Preferred model is 2950: supports the commands, rather cheap on eBay. A 2960 is newer, has some more options (including limited layer 3 abilities and QoS), but is more expensive. A 2970 is like a 2950 but it has gigabit ports: although more expensive, you can use this one as a switch for gaming or in your home network too. 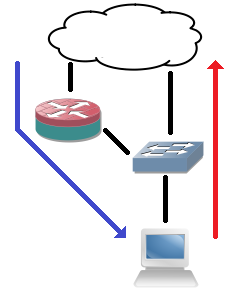 For CCNP you’ll need two layer 3 switches. For CCIE you can even go for layer 3 switches only. 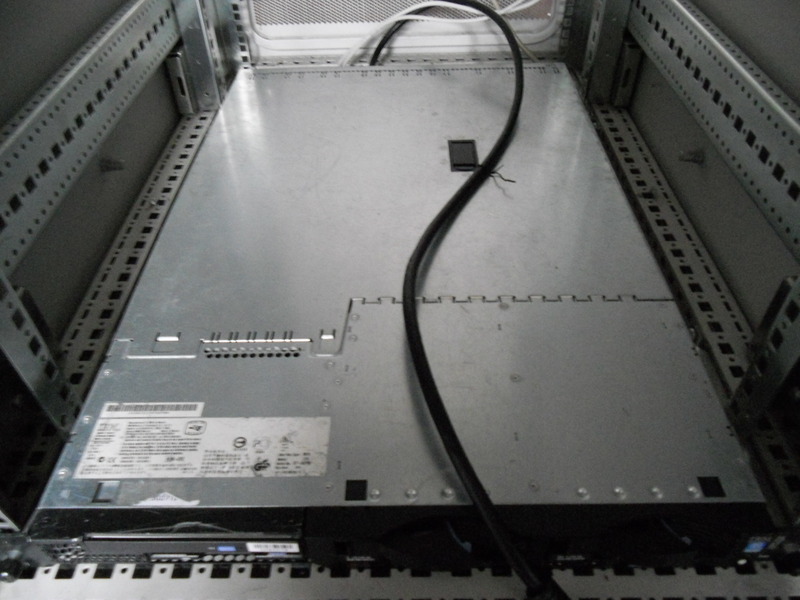 A 3550 has the same advantages as the 2950: supports the commands, relatively cheap. For CCIE, I would recommend at least one 3560: vastly more expensive, but supports Private VLANs, better QoS, and these models are used on the official CCIE lab exam I’ve heard, so it’s a good thing to know the equipment. A 3750 is a 3560 with a stacking option: fun, but no need for in a lab, so the same value as a 3560. Not mandatory, but having a switch with PoE is fun for some extra commands, especially when you have multiple IP Phones in the lab (explained below). This is usually visible with ‘P’ in the model number, e.g. WS-C3560-24PS-S and WS-C3560-24TS-S: both the same model, except the first one is PoE. When in doubt, check the model number on cisco.com. The number of ports doesn’t matter for the IOS: an 8-port 3560 can run the same IOS as a 48-port one. The fewer ports, the fewer power they consume. I’ve heard of INE topologies requiring 9-10 ports being used on one switch, so it’s best to have at least two switches with 12 ports or more when going for CCIE. 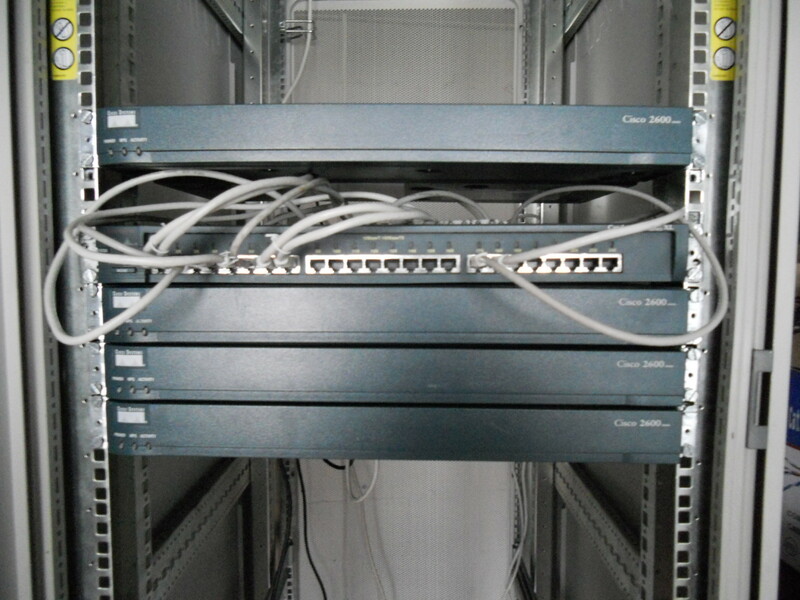 WS-C3560-8PC-S: no fan, 8 10/100 PoE ethernet ports, gigabit ethernet uplink. Any switch with ‘XL’ in the name (almost the opposite of routers, where ‘XM’ is good). These switches are old and don’t even support all commands needed in CCNA. They can be complementary in larger topologies, but that’s about it. A 1900 series switch. They’re 10 Mbps, and too old to support most commands, like the ‘XL’ ones. Modules: SPFs and GBICs can be useful, optionally, but really aren’t required in a lab. Cisco IP Phones. They can be pinged, interact with CDP, can mark frames with QoS, have port 80 reachable, and use just a few Watts of power on a PoE switch, and still less than a computer on external power. They’re cheap host computers really, so having one, maybe two, can come in handy, even if not going for a voice cert. The 7900 series are good. A rack. Once your lab grows in size, this can be useful because otherwise your lab will become a mess quickly. They’re not cheap though. A computer capable of virtualization. Useful for GNS3, or to run VMs, acting as hosts, to try out stuff. You can even consider running an ESX for a while to see what is does and experiment with trunking and port aggregation. 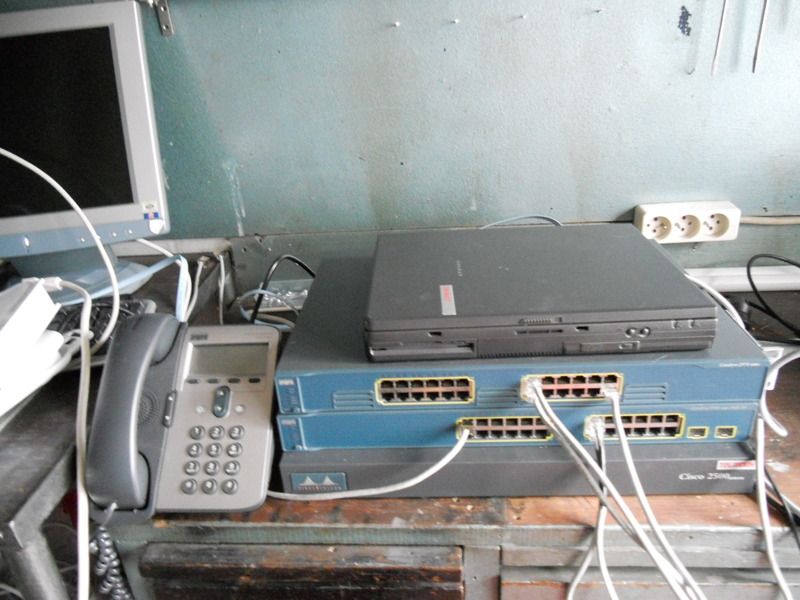 A non-Cisco network device: networking isn’t purely Cisco, and it’s nice to test a multivendor environment sometimes, though not needed for the certifications. Some people have a Juniper (they have certifications too), I have a Vyatta running, others have HP switches. Ethernet cables & cable making gear: making your own ethernet cables is part of the experience. If you’ve never done it, try to practice it. It’s also cheaper than buying premade cables, and you will need a lot for your lab. Serial cables: for frame-relay mostly. A DB60 male-to-male DCE/DTE cable fits on the NM-4A/S, NM8A/S and WIC-1T modules. I’m just going to mention it: you won’t need fiber. Granted it would be fun to play with, but it’s expensive and above most budgets. A new 5 meter fiber can actually cost more than a second-hand 2621XM. And I wouldn’t recommend buying used fiber. A Cisco professional Access Point. I’m not an expert, but an Aironet 1200 series seems to be a reasonable price on eBay. It’s 802.11b/g, as wireless-n is too expensive. But it allows for wireless configurations, like multiple SSIDs mapped to a trunk link. These models work on PoE, so check if they come with a power injector if you don’t have a PoE switch. And last: a console cable! This one is mandatory. Try to get these for free first: they’re sometimes included in a sale, or ask the IT staff were you work if they have one to spare (a good way to meet the right people, too). Also, check if your pc has a COM port, or you’ll need a USB-to-COM converter too. A typical Cisco console cable. Don’t buy premade packages by IT companies on eBay. They tend to be more expensive than all elements apart. Negotiate and haggle. Some of these devices are rather common, so choose the cheapest, and negotiate the price. Perhaps see if they’re willing to throw in something extra, like a free cable. Pay attention if accessories are present. A standalone router is cheaper than a router with console cable and serial cable, but if you have to buy the cables separately, will it be more expensive in the long run? Take your time. The best bargains for me were those that I’ve waited months for. And if you can’t find something at a price you want to pay, just wait. Ask for a printout of the boot sequence. If the seller knows his stuff, he should be able to give that. If the seller doesn’t know what he’s selling, that may be a lucrative deal, but beware of risks. I usually ask if I can pick the device up at their house. If they willingly give the address, that’s a good sign too. The printout also shows if the router is fine: I’ve once seen a printout with one self-test of an interface missing. You know at that point at least one interface is damaged. As part of the printout, you should be able to see the IOS version. This is very important: some devices are sold with ‘interim IOS software’, which is not production-ready, or contains only an IP base IOS, while IP services provides the most. This is not such a problem if you have better IOSes yourself, but can influence the price. You don’t need to build an entire lab in one step. Build it one device at a time, and learn while doing it. There’s no need for three layer 3 switches if you don’t have a CCNA yet, plan that for later. Don’t be too greedy. There is certainly no need to throw money away, but the best way to pass the certification exams is hands-on experience. I honestly wouldn’t have made it without that, and if you don’t work with the equipment all day, you’ll need a lab, online or at home. And the online labs aren’t free, and don’t give the same experience, so it’s actually a well-made investment. All the above is just my opinion and advice, based on personal experiences. Have anything to add? Let me know in the comments! A busy week it was once again. Special thanks to my friend Steve from Alfa+ who helped me finding half my current home lab, and delivered a rack on Tuesday to put all my networking stuff in. Now it’s less cluttery, it takes less space, and it’s more secure behind a locked door. If you make mistakes when configuring HRSP, it’s not always immediately visible in the network, but it often causes MAC address flaps on the switches, which gives an early warning that something is wrong. Also, when finetuning the timers, setting them too low will make the entire HRSP setup unstable because minor hiccups trigger many events. HRSP with authentication is at times quite pointless. I’ve noticed instances of HRSP with the wrong authentication that kept being active on the network. It’s better to implement logging and alerting to warn when changes are detected, and the above MAC address flaps are noticed, because that’s a typical symptom if everything else seems fine. It’s not really something that can be solved easily: if router A uses HRSP with password Test01, and router B uses HRSP with password Test02, which one is the legitimate router, and which one isn’t? It seems both routers assume the other is wrong and start being an active HRSP router, ignoring the other. ROMMON mode allows for the direct manipulation of boot settings. It’s never fully explained in any Cisco source for any certification, but it’s really worth looking into. If, no, when something goes wrong and you know your way around ROMMON, you can recover everything in no time. You can also boot an IOS from TFTP to test it, before downloading it to the local flash. The ‘ip address dhcp’ command will make the router somewhat function like an end device and, depending on the IOS version in use, the received IP will be stored in the running-config, along with a default-gateway. IP options so far do not seem to be copied in running-config. Also, if your DHCP server is a Cisco device, it seems to recognize the difference between a Cisco router and a computer, because the lease time is set to infinite, despite that this is not defined in the DHCP pool. I’m not sure, but it seems to suggest these devices work together (perhaps with CDP?) to allow for speedy network deployment without the disadvantages of dynamic IP addresses. I would research it some more, but it’s really not a priority right now with the CCNP SWITCH exam in mind. A 3560 switch, to my surprise, supports Auto-MDIX, allowing me to connect switches together using straight cables. It seems you can check it with a hidden command (not visible when using ‘?’): ‘show controllers ethernet FastEthernet0/1 phy’. Nevertheless, I’ll keep using my cross cables for the port aggregation labs, but I now can use my longest (straight) UTP from switch to switch, which comes in handy. Hopefully next week I’ll make some more progress. Greetings!